What happens when you try to beat the house with fake currency? Chances are, you’ll get caught and end up in the big house. That’s what’s happening to Bernardo Lecaros after he passed thousands in fake money at a Florida casino to the tune of $5,400. 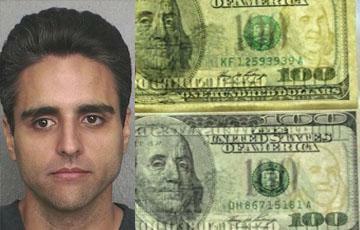 Judging by the $37,800 in fake bills found in his trunk, he planned to pass even more money. Lecaros is now facing federal charges in addition to state charges after he was arrested by the US Secret Service upon the conclusion of a lengthy investigation into why fake cash kept showing up at the casino’s cashier. The fact that the alleged counterfeiter passed fake bills through the casino and was caught isn’t surprising. What is surprising, however, is that Lecaros got away with it for so long, even though he’s been caught before. The charges Lecaros faces include passing $2,400 in fake bills on December 10th, passing $3,000 on December 14, and having fake bills in the trunk of his rental car. It’s no secret that you can’t pass counterfeit money at online casinos. After all, there’s no passing of physical bills. Everything is electronic, so the funds exist either in a bank account, in a 3rd party account, or on a credit card. It gets better. Or worse. Lecaros has already served 7 months in the slammer for passing $6,300 in counterfeit bills at Seminole Class Casino and Seminole Hard Rock Hotel & Casino. So how should casinos avoid being the victim of counterfeiting? For one, a solid counterfeiting bill detector needs to be in place. Many casinos have black lights at the cashier, which they can use to check the validity of a bill. But at the tables, those black lights often don’t exist. Instead, the dealers have a marker which can detect counterfeit bills. However, it’s not always foolproof. And even really good counterfeiters can fool a black light into thinking the bill is real. That’s why we could see ourselves moving to a cashless system at live casinos. Instead of dropping bills on the table, casino players could see themselves tapping their bank cards (in the even that NFC technology is present) or swiping their credit cards (or inserting the bank card’s chip). This system would erase the possibility of counterfeit bills entering the economy through a casino. However, there is one limitation to this option. Many people don’t keep their casino funds in their bank account. For example, whenever it’s my birthday and family members hook me up with cash, I enjoy a quick Atlantic City getaway. I charge food and lodging to my credit card, but I use the cash to gamble. And if I walk away with winnings, that money is used for my next trip. I never, ever, use my card to withdraw money for gambling. There is a solution, though. Instead of tapping a bankcard at the tables or slots, casinos could ask everyone who is gambling to load a player’s card with cash. They would have stringent counterfeit bill detection technology to ensure that the money being placed on the card is legit. And players could then tap that card at the table to play. Who are we kidding? Cash will be king for a long time at land-based casinos. And with the kind of money the big players rake, losing millions in counterfeit bills is probably cheaper than upgrading their technology to stop it.